Clinton had supported a controversial bill in the U.S. House of Representatives to establish a control board stacked with Republican congressional appointees which could impose harsh austerity measures to deal with Puerto Rico’s $70 billion debt. After Sanders came out against the bill, Clinton now has voiced vague reservations about the measure. What to do about Puerto Rico’s debt is perhaps the key immediate issue. 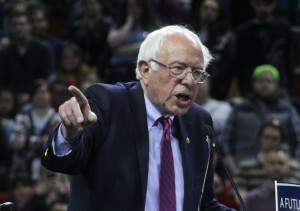 While Clinton’s posture is shifting, Sanders has been a clear and outspoken opponent of the disastrous House Republican plan to impose an unelected control board that could slash pensions, close hospitals, fire teachers, raise taxes and privatize government assets without any input from the island’s 3.5 million American residents. Clinton now says Puerto Ricans should “have a voice in any oversight board.” Sanders position is clearer and stronger. “I am glad she is taking a new look at the control board but this is too little, too late,” Sanders said. Sanders said he will soon introduce legislation that would allow Puerto Rico’s debt to be restructured in a way that protects pensions and ordinary investors. His legislation will make it clear that the Federal Reserve has the authority to facilitate an orderly restructuring of Puerto Rico’s debt. It also would provide emergency assistance to Puerto Rico to create jobs, reduce the poverty rate and end the territory’s reliance on dirty fossil fuels.